It’s been long I’ve reduced the use of physical exfoliators from skincare routine. In 2015 I’ve struggled a lot with my skin. My skin was suffering big time due to sensitivity and dryness. At one point I felt having rashes became a permanent situation of my skin. In 2016, I stepped up my skincare with chemical exfoliants, mostly peeling solution/serums. My skin recovered from having rashes or such. Where Olay Regenerist Skincare range helped me significantly. From early this year, 2017, I’ve been into exfoliating toner which has AHA (alpha hydroxy acid), BHA (beta hydroxy acid), glycolic acid etc. 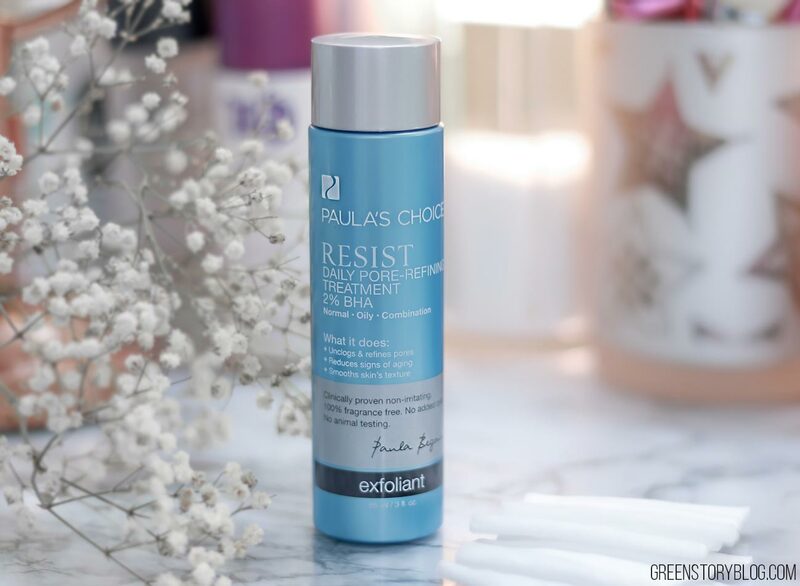 Last month I was introduced to Paula’s Choice RESIST Daily Pore-Refining Treatment AKA exfoliating toner with 2% BHA. What is an exfoliating toner with BHA does? BHA short form of Beta Hydroxy Acid or Salicylic Acid. This substance is simply an oil-soluble exfoliant. Which means BHA agent is more appropriate for an oily to combination skin. It also works as an anti-inflammatory, antiseptic and skin conditioning agent. The skin care lover adores it especially when it comes to preventing age sign. BHA exfoliates the skin from the upper layer of skin, stimulates new cell growth. Research says, the right amount of BHA concentration helps to improve skin texture, collagen production, wrinkling, and hyperpigmentation. Moreover, by removing the dead skin cells, a BHA exfoliant/toner enables the skin to absorb other anti-aging products (a targeted serum, moisturizers) to its maximum potential. Water, Dipropylene Glycol, Pentylene Glycol (slip agents and penetration enhancers), Salicylic Acid (beta hydroxy acid exfoliating agent), Butylene Glycol (slip agent), Polysorbate 20 (emulsifier) Palmitoyl Tripeptide-1, Palmitoyl Tetrapeptide-7 (cell-communicating ingredients), Dipotassium Glycyrrhizate(anti-irritant), Nordihydroguaiaretic Acid (antioxidant), Oleanolic Acid (anti-irritant), Sodium Hyaluronate (skin-repairing ingredient), Allantoin (anti-irritant),Trehalose (skin-repairing ingredient), Panthenol (skin-conditioning agent), Glycerin (skin-repairing ingredient), PEG-60 Almond Glycerides (emulsifier), Caprylyl Glycol (skin-conditioning agent), PEG/PPG-18/4 Copolymer (solvent), Methyl Gluceth-20, Bis-PEG-18 Methyl Ether Dimethyl Silane (skin-conditioning agents),Glycereth-26 (emollient thickener), Sodium Metabisulfite (stabilizer), Sodium Hydroxide (pH adjuster), Carbomer (gel-based thickener), Disodium EDTA (chelating agent). The products claim to be completely gentle, non-abrasive on the skin. Promises to visibly refine pores and improve skin texture. Daily use of it can help to smooth fine lines and wrinkles, as well as unclogging and minimizing pores. Also claims to be effective in reducing acne breakouts, blackheads, and enlarged Pores. This exfoliant is just like water, fragrance-free and non-sticky. I’m using it in my PM skincare only ever since I got it in hand. After washing my face I take a lint-free cotton pad, dispense 4-5 drops to soak the pad. Then apply all over my face and neck in an upward motion. Then I follow up with my other skincare stuff. I don’t use a regular toner since I’ve been into exfoliants. This alone does the job for me. I’ve used Paula’s Choice Earth Sourced Cleansing Gel earlier and fell in love. It’s been a pleasant journey with RESIST Daily Pore-Refining Treatment as well so far. The toner went with my combination skin very nicely. I was able to notice a significant change within just 8/9 days. First of all, the exfoliant felt gentle on my skin compared to the Pixi Glow Tonic I was using before that. It was more effective in taking off dead cells. I noticed a healthy glow within a short time. After using the toner there was always some dirty residue on the cotton pad no matter how well I cleaned my skin which gave me a feeling that the exfoliant surely cleanses pores from the deep inside. My skin is behaving pretty good this year so I can’t really tell how it works on acne or such thing. About anti-aging benefits, I’m not sure either. Because, obviously, age lines don’t go away over the month. Nonetheless, I’ve become a fan of this product. I already made up mind to continue using it. The only thing I wish if the toner was available in a bigger size bottle. The large amount available now is 88ml which runs out pretty fast. Hence, I highly recommend this exfoliating toner to those are over 30. Are you using any exfoliating toner with BHA, AHA, Glycolic Acid or maybe Mandelic Acid toner? Which one is your favorite? Available to purchase online at Paulas Choice website. Bausch+Lomb Lacelle Jewel Contact Lens - my eye approves?